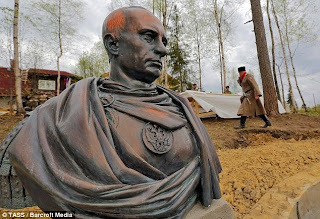 The bust, created by the St Petersburg Cossack Society to mark Russia's victory over Nazi Germany in the Second World War, has been unveiled on a plot of private land in the north. Andrei Polyakov, a local Cossack leader, said the idea for the bust came about after Russia's annexation of Crimea last year. It will remain perched in the small town of Vartemyagi, which is located just outside the northern city of St Petersburg. Vladimir Belyancheko, a member of the society, said: 'In this image we see manhood. This is the image of a victor, and probably a model for our Russian democracy,' according to The Telegraph. He said: 'Cossacks would want to have an emperor for life, who would give strength to the state and would take care of Russia's destiny throughout his whole life. 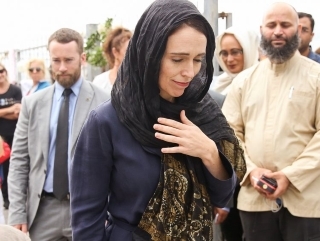 Well, I cannot image any other leader beyond maybe Kim Jong-un of North Korea getting this sort of hero worship from his subjects. I know I have readers who struggle to believe that Russia is now on the war path and the aggressor in Ukraine. My question to those readers is, beyond what I have posted in the past week, what more do you need?